Postcast hypertrichosis is a common transient occurrence in orthopedic patients and generally resolves within a few months. Until now, two cases of localized hypertrichosis occurring on more than one pre-existing psoriatic lesions are reported in the literature. We describe the case of a patient who simultaneously developed a single psoriatic plaque and overlying localized hypertrichosis after plaster application. This concurrence is exceptional and may be explained by the expression of several growth factors and cytokines influencing both the hair cycle and the psoriatic inflammatory working. We describe the case of a young woman who developed localized hypertrichosis and psoriasis on her left lower extremity following a fracture and plaster application. The sudden appearance of postcast hypertrichosis and post-traumatic psoriasis are well-known events if considered separately, but their concurrence is exceptional and may be explained by the expression of several growth factors and cytokines involved in the pathogenesis of both conditions. 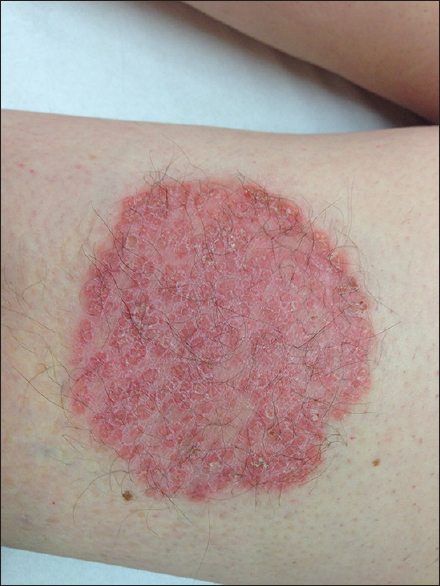 A 23-year-old woman was seen because of excessive hair growth on a psoriasis plaque of her leg, following prolonged immobilization in a plaster. In fact, approximately 1 month before the visit, she was involved in a motor vehicle accident and fractured her leg. She had a 9-year history of mild psoriasis vulgaris, successfully controlled by the topical application of coal tar and steroids. However, she had been completely free from psoriasis lesions for the last year without any treatment. On physical examination, a round erythematous scaly plaque measuring 4 cm × 4 cm with tufts of hair was present on the extensor aspect of the left leg, localized on where the plaster had rubbed [Figure 1]. Excessive hair growth was not evident in any other body region. The clinical findings were consistent with both localized hypertrichosis secondary to plaster application and psoriatic isomorphic response. During the subsequent 2 weeks, a topical mid-potency corticosteroid cream was applied two times daily on the lesion, with a prompt resolution of the erythema and scaling. The hypertrichosis gradually lessened within 2 months, and no additional treatment was needed. The psoriatic hair alterations reported in the literature comprise temporary hair loss, scarring alopecia, ultrastructural abnormalities, and also two cases of localized hypertrichosis. However, in these cases, localized hypertrichosis occurred on more than one pre-existent psoriatic lesion, probably as a result of sustained arterial hyperemia due to chronic inflammatory stimuli, even if the exact underlying mechanism is still unknown. In our patient, the appearance of a single psoriatic plaque and overlying localized hypertrichosis were simultaneous, opening new scenarios on the relationship between psoriasis and hair. Hair involvement in patients with psoriasis is one of the most common events over the course of the disease (50%–80% of cases). Hair loss due to scalp psoriasis is frequent, but alopecia is almost always noncicatricial, and complete regrowth occurs when inflammation burns out., In our case, psoriasis did not negatively interfere with the hair cycle, on the contrary, it seemed to stimulate hair growth. We hypothesize that the psoriatic Koebner phenomenon was at the basis of both hair growth and plaque appearance, probably through shared signaling pathways influencing the hair cycle and the psoriatic inflammatory process simultaneously. The expression and production of growth factors and cytokines involved in this mechanism should be further investigated. Chang CH, Cohen PR. Ipsilateral post-cast hypertrichosis and dyshidrotic dermatitis. Arch Phys Med Rehabil 1995;76:97-100. Yuen MW, Lai LK, Chan PF, Chao DV. Acquired localised hypertrichosis in a Chinese child after cast immobilisation. Hong Kong Med J 2015;21:369-71. Ma HJ, Yang Y, Ma HY, Jia CY, Li TH. Acquired localized hypertrichosis induced by internal fixation and plaster cast application. Ann Dermatol 2013;25:365-7. Kumar B, Sandhu K, Kaur I. Localized hypertrichosis in subsiding psoriatic plaques. J Dermatol 2004;31:693-5. Almeida MC, Romiti R, Doche I, Valente NY, Donati A. Psoriatic scarring alopecia. An Bras Dermatol 2013;88:29-31. George SM, Taylor MR, Farrant PB. Psoriatic alopecia. Clin Exp Dermatol 2015;40:717-21.